150e For years, Taylor’s sleek, ultra-playable necks have helped define a great 12-string experience. 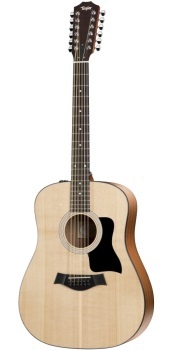 The 12-string Dreadnought 150e fits that signature playability and tonal clarity into an affordable package, making a quality 12-string more accessible to budget-minded players looking to broaden. Includes gig bag.